The RIBA Archives, held at the V&A, feature 64 folders of Goldfinger’s drawings and several boxes of his admin, notes and press cuttings on the Brownfield Estate. The transcriptions below are taken from letters sent, receipts collected and press reports given by Goldfinger during his stay. I received permission to share scans of these documents with Balfron’s current and former residents in two performative group events held at the tower but am sadly not permitted to share these further.​ I encourage you to visit the archives and have included links to facilitate your visit above. I have also included a link to the 495 photographs and drawings of Ernö Goldfinger which have been made available on the RIBA PIX website. Attached is a PDF list of original tenants of the tower compiled from the archives. Thank you for your letter of 26th February. I agree that it would be nice to provide cafes as part of the development but, unfortunately, money for this can hardly be provided from a local authority budget. The best that a local authority can do is to provide spaces for shops and hope that someone will take the opportunity to run one of them as a cafe, but, as you say, this seldom happens. Thank you for your nice letter, which was sent on to me by the News of the World. I am finding my stay on the top floor of Rowlett Street Housing, a most interesting experience. Last week, I attended a meeting of the local tenants’ association where I explained the design and working of the flats and the tenants expressed their views. Of course, there are some teething troubles, but most problems were easily sorted out by explanation. Most of them just love the flats. One advantage of this particular tall block is the magnificent view of the River Thames and its shipping. In fact, I feel rather reluctant to leave it and return to my own house in Hampstead. Thank you for your letter of 23rd February. I am sorry to hear that your house is so noisy. The only effective solution I can think of would be to install double glazing on all the windows. I appreciate this would be an expensive proposition. As you say, ear-plugs are a cheaper alternative. Thank you for your nice letter. I can assure you that I am much enjoying living in the high building, overlooking the Thames and can understand your desire to do the same. The real difficulty is to find somewhere which is both easily accessible and on the river-front. I do not know of any suitable property at the moment, but will keep my ears open and let you know if I hear of anything which would be a possible conversion, bearing in mind the financial limit you mentioned. This is Mr. MacDonal [sic] speaking flat 139 on the 24th floor access to 24th floor the up-flat facing East West. He has lived in the neighbourhood - actually has mother also lived here. His son lives here not far - one can see his house from here. E.G. “Do you have any whistling noises in the living room and the windows?”. Mrs. M. “Well, occasionally but not a lot to grumble about. I don’t find no fault with the place at all”. Mrs. M. “Yes sometimes we meet going into the lift or on the ground floor and every one speaks. Everyone is sociable and that is God’s truth. Mrs MacDonald = “Mrs Goldfinger you should stay longer! You are ACCEPTED. I know all the tenants and I’m telling the truth you are ACCEPTED.” Asked us to party 6pm wedding ____ 34th. April 6th. Gave us 2 little elephants. ___ asked us for drinks end of week. Mrs MacDonald drank whisky the others gin and tonic. ___ very welcome. 2 1/2 pints eaten. Mr and Mrs Mills Flat 143 stolen at police station. This is just to say how much I have appreciated the loan of the cooker and hood, refrigerator and fan heaters for my temporary flat. As I expected, I have had numerous visitors and guests, many of whom have envied me such an up-to-date cooker. I was also able to provide them with ice-cold drinks, thanks to the refrigerator. The fan heaters were invaluable, as the heating system broke down and without them we would have frozen. I understand that you are arranging for collection to-day and that the meter will be read and disconnected tomorrow. Defects under guarantee to be remedied by the builder. Direct observation by ourselves (my wife and myself, living in the flat) and communicating with our neighbours. Reports from the Tenants’ Association. Clerk of the Works’ reports. Observations as an Architect regarding planning and future planning, and detailing. The success of any scheme depends on the human factor - the relationship of people to each other and the frame to their daily life which the building provides. These particular buildings have the great advantage of having as tenants, families with deep roots in the immediate neighbourhood. In fact, most families have been re-housed from the adjoining streets. Of the 160 families, all except two, came from the Borough of Tower Hamlets. The nine access corridors form so many East End pavements, on which the normal life of the neighbourhood continues. On 7 of these pavements there are 18 front doors while, on two levels - the ground floor and the 15th floor where there are maisonettes, there are 8 front doors. As far as possible, people from the same area were re-housed together - street by street. The people who occupy these flats continue to work in the same jobs as before they moved; children go to the same schools as before. The future: Provisions which are lacking, which are partly in the process of being remedied, are the common facilities. This is a delicate point which has been plaguing housing for half a century - the difficulty of deciding how much of the common facilities are attributable to housing proper and how much comes under other headings. This is, of course, an organisational problem which I had better not enlarge on…. For the toddler in immediate contact with his mother; large terraces have been built in each flat, where the mother can supervise her small child or children from the dining/kitchen or the living room. On the ground floor, for these same children and those of up to say 5 years old, there is a sunken play area with slides, towers, water and sandpit. These are to be completed by a supervised day nursery, placed in the proximity of this play area so that the whole thing can be supervised. For teenagers, rooms have been built in the service tower, away from the dwellings for: a) table tennis and/or billiards. b) jazz/pop room. c) hobby room, which can also be used for older people. The administration of these space represents certain problems but, I understand that the Tenants’ Association is willing to take the responsibility. For older people, a clubroom which is to be provided in conjunction with a day nursery in such a way that the facilities of the day nursery will enlarge those of the clubroom at night. Here again, certain problems of organisation are involved but, it seems that they can be overcome. The whole area of some 4 acres, has been made into a pedestrian precinct with underground garages and car access at low level. The management, on the whole, seems to be working well, which is not surprising in view of the GLC’s enormous experience over so many years. Nevertheless, at the very beginning, a great mistake was made by not providing the tenants with adequate information about their new and unfamiliar building. This caused considerable trouble with such trivial things as: window cleaning, fixing curtain rails, use of central heating, availability of garages and storerooms. The tenants were simply not told! Explanatory leaflets have now been provided which have helped a lot. There were other trivial organisational difficulties under this heading such as lighting the garages, access balconies and escape stairs. On the whole, the general disposition of the buildings and the flats are acceptable. I am prepared to repeat the same design in future schemes. The main characteristic of the building is the separation of living quarters from the services. These latter are housed in a separate tower, connected to the flats by bridges. Thus, all noisy machinery, such as lift motors, water pumps, fire pumps, rubbish chutes etc. are 100% insulate from the dwellings. Why did Ernö and Ursula Goldfinger briefly move in? 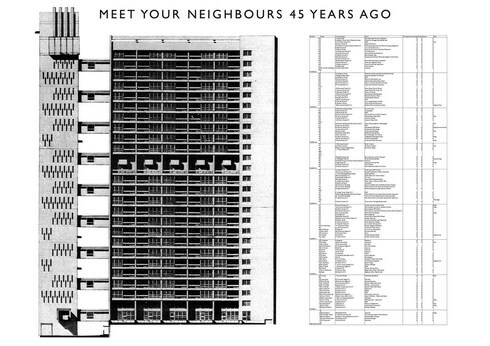 Who lives in Balfron Tower? These particular buildings have the great advantage of having as tenants, families with deep roots in the immediate neighbourhood. In fact, most families have been re-housed from the adjoining streets. Of the 160 families, all except two, came from the Borough of Tower Hamlets. As far as possible, people from the same area were re-housed together - street by street. How did Ernö Goldfinger describe it? The future: Provisions which are lacking, which are partly in the process of being remedied, are the common facilities. This is a delicate going which has been plaguing housing for half a century - the difficulty of deciding how much of the common facilities are attributable to housing proper and how much comes under other headings. This is, of course, an organisational problem which I had better not enlarge on…. What does it feel like to live in the tower?